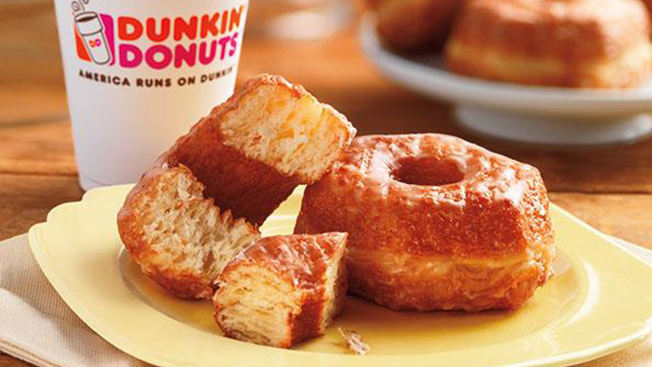 Next Monday, Dunkin' Donuts will roll out a croissant-donut hybrid across the U.S. But if you think the chain is copying the now-famous cronut from New York-based bakery Dominque Ansel, think again. "Are we copying a specific bakery in New York? The answer is no," John Costello, president of global marketing and innovation for the company, told the Associated Press. Costello says bakers all over the country have been experimenting with the croissant donut mixture for the past two decades and that Dunkin' is constantly tracking these trends. Right. And Dunkin' apparently already has a hybrid version in South Korea called the New York Pie Donut. At any rate, the cronut-like pastry will be available for $2.49 in Dunkin's roughly 8,000 locations for a limited time. Oh, and it'll be topped with the same sugary goo that's used for the shop's glazed donut, but don't expect any creme filling. At least, not yet. The brand uses its various social media channels regularly to announce deals, reward possibilities and new products. The brand uses similar content across all channels, but the way it interacts with fans on each seems to differ. On Twitter, the brand replies often to happy or annoyed customers, while on Facebook, random complaints (a recent one noting that the chain's "eggs are disgusting" wasn't met with any reply) don't gain as much traction. Recent spots have been Halloween-friendly. It was founded in 1950 in Quincy, Mass., by Bill Rosenberg. The first franchise shop opened in 1955. The brand's current slogan, "America Runs on Dunkin'," has been around since 2006. Dunkin' Donuts' many locations are owned by roughly 1,000 franchisees. The franchisees pay fees to the parent company, Dunkin' Brands, and some gross more than $250 million a year.